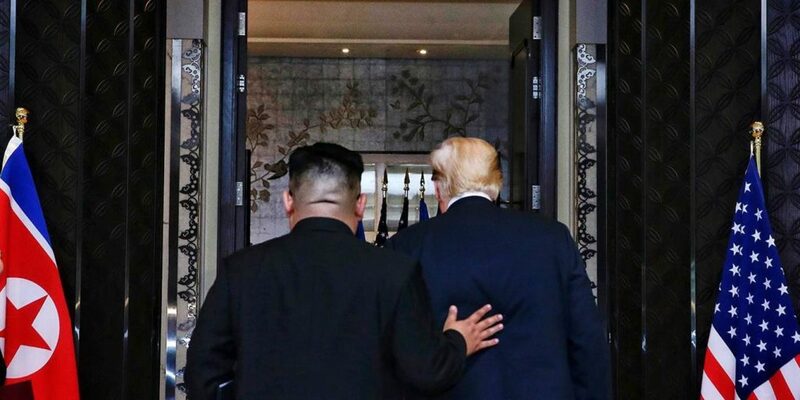 Donald Trump’s depiction of his meeting with North Korean leader Kim Jong-un as a great success that solved the nuclear problem could make it tougher to maintain international support for the economic sanctions that are still needed to pressure Kim. Weakening the prospect of achieving one’s goals is not the mark of a strong negotiator. There is only one catch: what Trump claimed was untrue. The nuclear threat posed by North Korea remains undiminished. The joint statement issued by the two leaders was as brief – just 391 words – as it was vague. The statement was far more about aspirations than accomplishments. North Korea committed only “to work toward complete denuclearization of the Korean Peninsula.” Missing was any definition of what denuclearization might entail, a timeline for implementation, or a reference to how any actions would be verified. Other issues related to nuclear weapons, including ballistic missiles, were not even mentioned. Thus far, at least, the agreement with North Korea compares unfavorably to the Iran nuclear deal that Trump denounced – and then renounced a month before meeting Kim. This is not to argue that the Singapore summit had no value. At least for now, bilateral relations are in a better place than they were a year ago, when North Korea was conducting nuclear and missile tests, and observers (including me) were busy calculating the chances that the two countries would be making war rather than peace. And, looking forward, there is, in principle, the possibility that the United States and North Korea will be able to reach agreement on the many relevant issues and details that the Singapore summit statement left out. There is also good reason to doubt that North Korea, arguably the world’s most closed and secretive country, would ever permit the sort of intrusive international inspections that would be required to verify that it had complied with undertakings spelled out in some future pact. Trump seems to think that Kim can be swayed not simply by threats and pressure, but by flattery and promises as well. The White House released a four-minute video that showcased Kim as someone who could be a great historical figure if only he would fundamentally change. The video also went to great lengths to show what North Korea could gain economically were it to meet US demands. The president even spoke of the North’s potential as a venue for real-estate development and tourism. What seems not to have occurred to Trump is that such a future holds more peril than promise to someone whose family has ruled with an iron grip for three generations. A North Korea open to Western businessmen might soon find itself penetrated by Western ideas. Popular unrest would be sure to follow. In fact, some of Trump’s post-summit remarks have actually weakened the prospect of achieving his goals. His depiction of the summit as a great success that solved the nuclear problem will make it that much tougher to maintain international support for the economic sanctions that are still needed to pressure North Korea. Trump also did himself no favor by unilaterally announcing that the US would no longer conduct what he described as “provocative” war games, also known as military exercises meant to ensure readiness and enhance deterrence. In so doing, he not only alarmed several US allies, but also gave away what he could have traded for something from North Korea. The danger, of course, is that subsequent negotiations will fail, for all these reasons, to bring about the complete and verifiable denuclearization of North Korea that the US has said must happen soon. Trump would likely then accuse Kim of betraying his trust. In that case, the US would have three options. It could accept less than full denuclearization, an outcome that Trump and his top aides have said they would reject. It could impose even stricter sanctions, to which China and Russia are unlikely to sign up. Or it could reintroduce the threat of military force, which South Korea, in particular, would resist. But if Trump concludes that diplomacy has failed, he could nonetheless opt for military action, a course John Bolton suggested just before becoming national security adviser. This would hardly be the legacy that Trump intended for the Singapore summit, but it remains more possible than his optimistic tweets would lead one to believe.